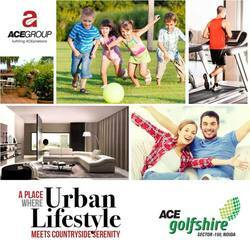 Ace Golfshire offers best flats in Noida Expressway with a unique opportunity to enjoy blissful facilities for lifelong. These 2 and 3 BHK low density luxurious apartment with only 75 dwelling units per acre, will rise as the top of elegance. Each and every part of Ace Golfshire is bespoken and standardized as per the need and means and this would fulfill your expectation.